If you live in the US, chances are it’s a bit of a drive to your nearest Uniqlo store. Like around a thousand miles. But from this week there’s another way to check out the wares of the Japanese clothing giant – the Web. The company – which occupies a similar space to Gap, H&M and Zara, offering stylish clothes at reasonable prices – launched an online store for US customers this week as part of a long-term strategy to expand its business in the country. Uniqlo currently only has five stores in the US – in San Francisco, New York and New Jersey – but is hoping to increase its bricks-and-mortar presence in a big way, with plans to open up to 60 new stores over the next two years and earn $10 billion in sales by 2020, Reuters reports. Rival clothing firm Gap has had an e-commerce site up and running since 1997, while Zara launched its own online service just over a year ago. 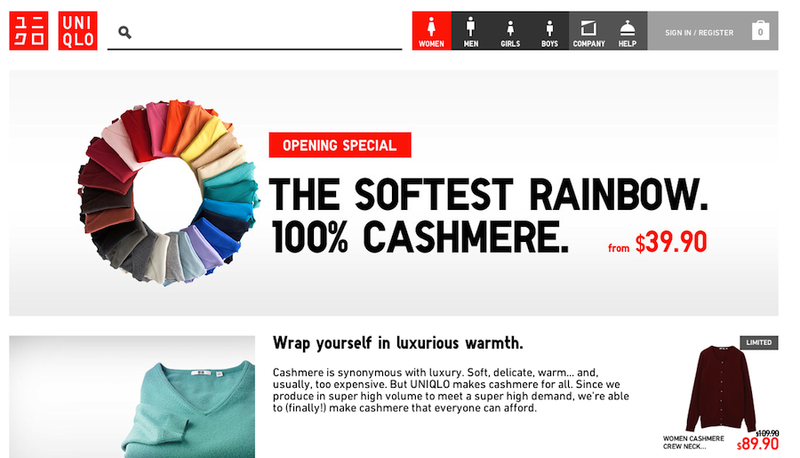 H&M says it’ll be launching an online store in mid-2013. While many fashion chains may offer only a fraction of their retail store inventory on their online shopping site, Uniqlo says it’ll be including everything in its Web-based store. In fact, it’s actually offering more items, with the addition of extra sizes such as XXS and XXL. Free standard shipping is available if orders exceed $100 ($7 fee for orders under $100), with items arriving in one to five days. Keeping the Web-based store up to date will be no easy task, and could prove to be a costly exercise too. “You need to have photographs of everything. You need to be able to zoom in and zoom out, turn the image 360 degrees,” Paula Rosenblum, an analyst for Retail Systems Research, told Reuters. “When you’re turning merchandise eight to nine times a year, that’s expensive.” But Uniqlo evidently sees it as a price worth paying in its quest to make an impact in the US market. Part of the Fast Retailing Company, Uniqlo is currently the world’s fourth biggest apparel retailer with more than 1,100 stores in over 12 countries. You can check out the clothing company’s new online store here.